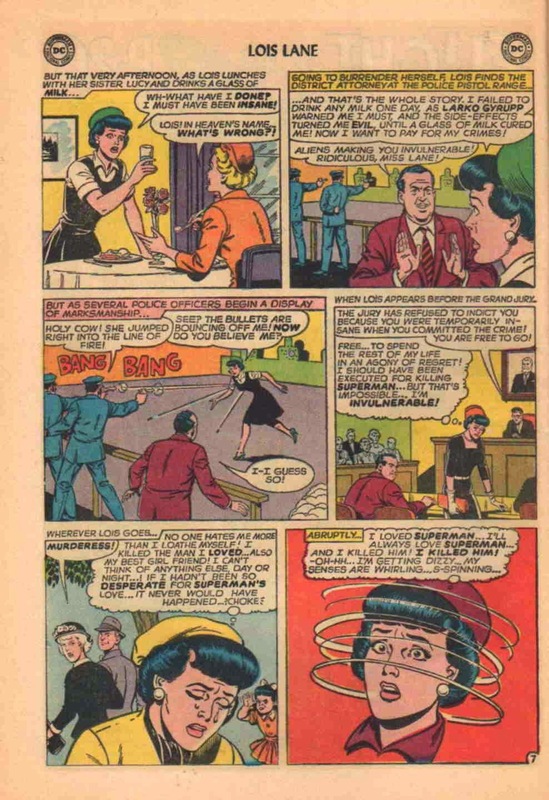 Second Story in Lois Lane #59: Lois, the Incomprehensible "B" from Hell! That will be your opinion, too, after reading this story from Superman's Girl Friend, Lois Lane. This is issue #59, cover-dated August, 1965. Just read the captions and thought balloons in the splash page. 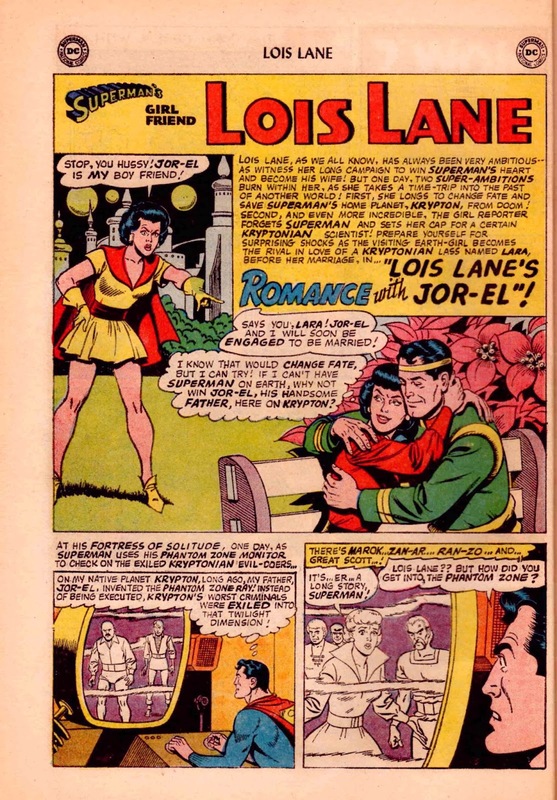 Remember, almost from the instant of their first encounter in 1938, Lois has had the hots for Superman, that dreamy Super-Guy! It's him -- only him -- that she loves! But in this story, she chucks all that. Why not go for Superman's hunky dad, instead? And check out that very 21st-century-looking pouty, spoiled-brat expression on Lois's face in the splash panel. Now we know where Rihanna, Miley Cryus, and millions of duckfaces were launched! Anyway ... to our story. Superman is just dusting the the exhibits in his Fortress of Solitude when he happens to pop in on the Phantom Zone, where he finds -- AWP! -- Lois Lane ?!?! In a Kryptonian fashion, too! Now we will learn how she got there. NOTE TO FELLOW ENGLISH MAJORS: Remember learning of this narrative device? It's called in medias res, literally meaning "into the middle of things." It's how The Iliad starts, too -- along with thousands of other stories from action-thriller TV shoes to romance novels to Sci-Fi radio shows, and on and on. 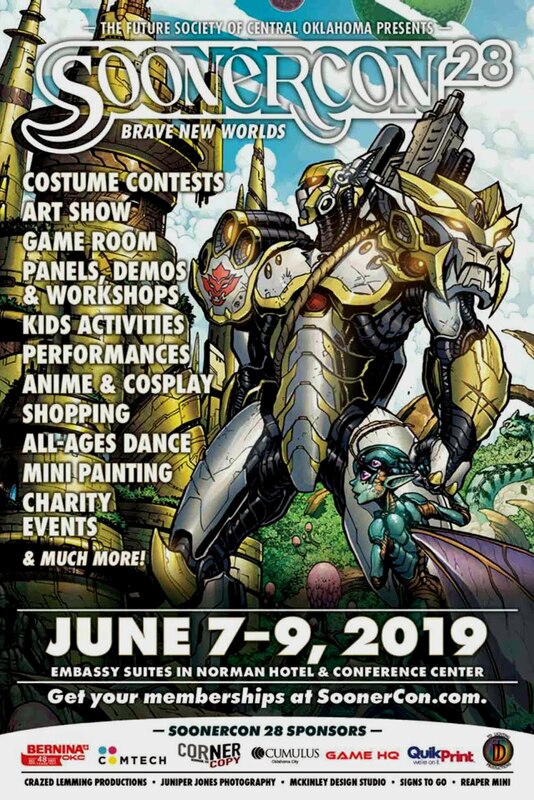 Its main attraction is its capacity to start a story out with a BANG and hook the reader/viewer/listener into a crisis, and then throw in that (potentially) boring backstory along the way. 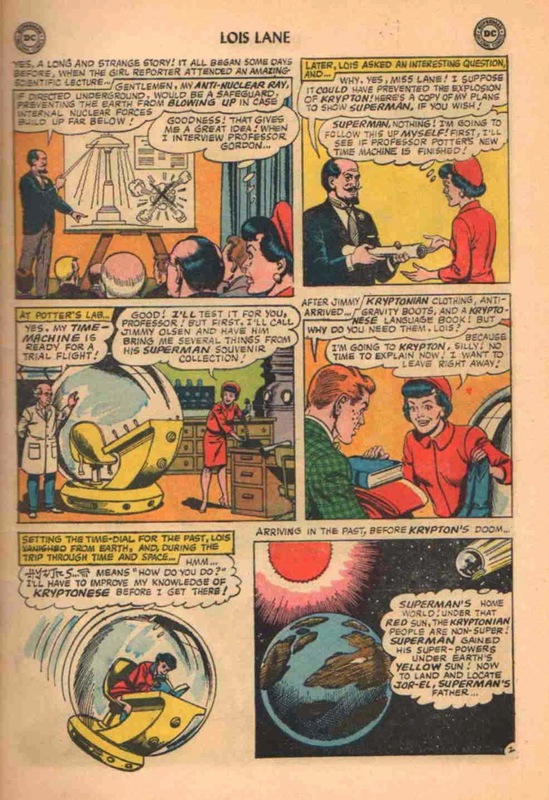 After attending a publicity launch for a scientist and his "Anti-Nuclear Ray," Lois charms him into giving her his proprietary plans in the delusion that she will give them to Superman. Next, she enlists Professor Potter and Jimmy Olsen as backup in her inspired mission. Why, she'll travel to Krypton's past herself, and prevent its destruction by sharing those plans with Superman's father, Jor-El! So she studies Kryptonese -- only ONE LANGUAGE for the planet? Oh, maybe she only learns the language spoken by the folks in Kryptonopolis, the planet's capital, and home to Jor-El. Now she uses her handy-dandy Time-Viewer to window-shop. What part of Jor-El's past does she wish to violate? Note the first panel's depiction of Jor-El's dorm room. We know it's a dorm room -- check out the college pennant on the wall! So Lois decides to invade a little later in his life, after Jor-El is established as a scientist. She lands the Time Machine safely without being detected by this advanced civilization's space defenses, and barges in on Jor-El in his underground research location. It's kinda funny that such a setting was also used for the opening scenes of Superman: The Animated Series's first story, "Last Son of Krypton." So, fibbing to Jor-El as to the origins of both her and the plans, she hands them over. 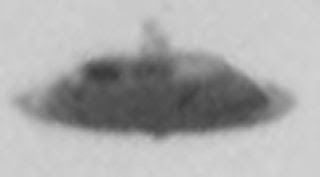 Hmmm, Jor-El says ... an Anti-Nuclear Ray to defend against alien invaders ... (like the one standing in front of him). Thinking her mission is accomplished, Lois heads back to her Time Ship and home, except -- criminently! The controls are jammed! She's stuck ... in the past! 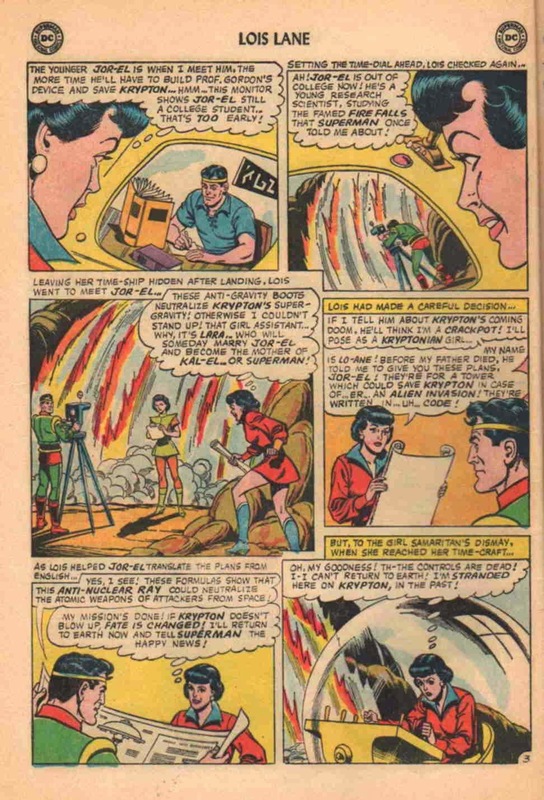 What will Lois do ... besides seducing Jor-El (we found that out in the story splash panel)? 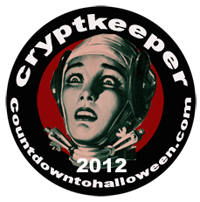 Stay tuned for our next exciting installment, on Monday! 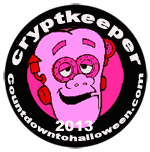 Same Super-time, same Super-channel! At the top of the last page of our story, Lois comes out of her guilty tizzy. After all, she murdered Superman, and then framed Lana Lang for execution for the Kryptonian's bump-off. Suddenly she comes to. Why, IT WAS ALL A DREAM! Just like a bunch of DC fans from twenty years ago (1993), she says, "tell me the death of Superman didn't happen?!" She is so afraid that what she dreamed might come true, she decides to divert from the time-line of her dream immediately, and demands an antidote to the Super-Sauce she just quaffed. So, while you ponder the permeations and permutations of preposterous pie plates, let's sell some ads, shall we? The top half-page ad is for AMT car models. Remember that these things were about $1.50. An industrious kid could do odd jobs and earn enough cash by returning pop bottles for deposit to get at least one of these babies per month. 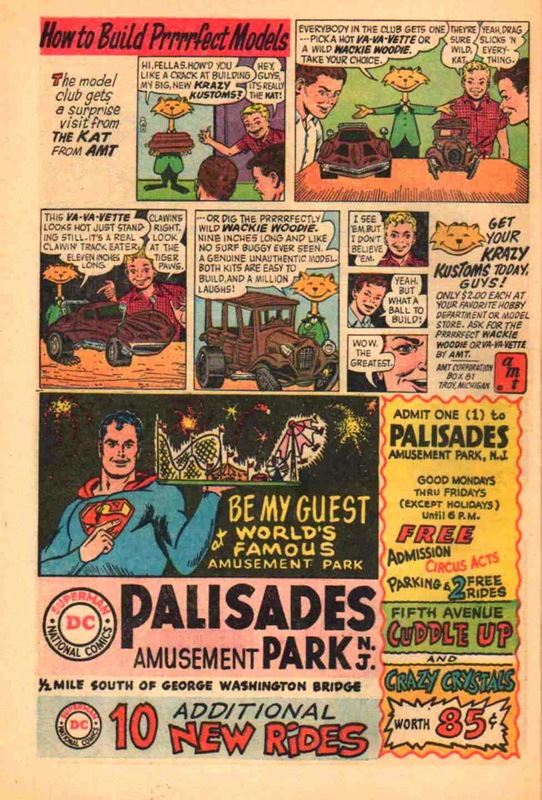 Being from the Great Southwest, my only exposure to Palisades Amusement Park was these ads in the comics. It wasn't until years later that I figured out that the 1962 song by Freddy Cannon, "Palisades Park," was about the same place. And remember the kids' song, "George Washington Bridge," sung to the tune of "Over the Waves"? That is the bridge mentioned in the ad. 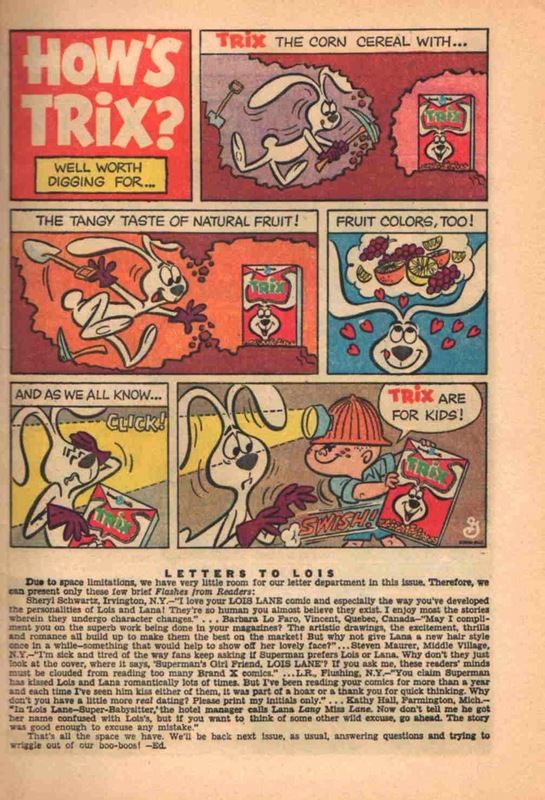 The tagline for this Trix ad, "How's Trix? ", is a silly wordplay on a phrase that started out a little crude -- but referring to card tricks, not streetwalker-type tricks. Silly rabbit! Trix are for kids! The bottom half of the page is this issue's only allotment of space for letters, so they only print some excerpts, with no art header or trailing mailing addresses. I may be singular in my feelings, but I have always been charmed by the editorial tone taken in these columns. Kid of like your big sister teaching you a new card game ... friendly and teasing, all at once. 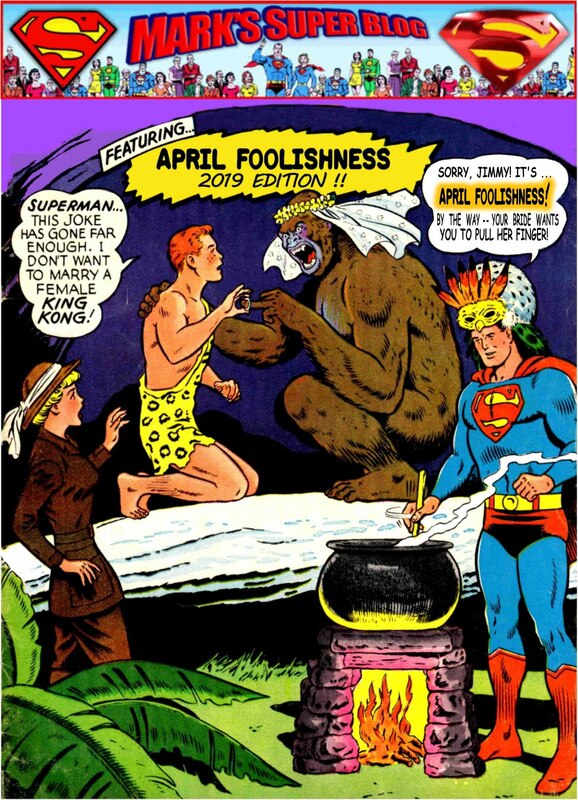 On Friday, we'll start the second story contained in Superman's Girl Friend, Lois Lane #59. 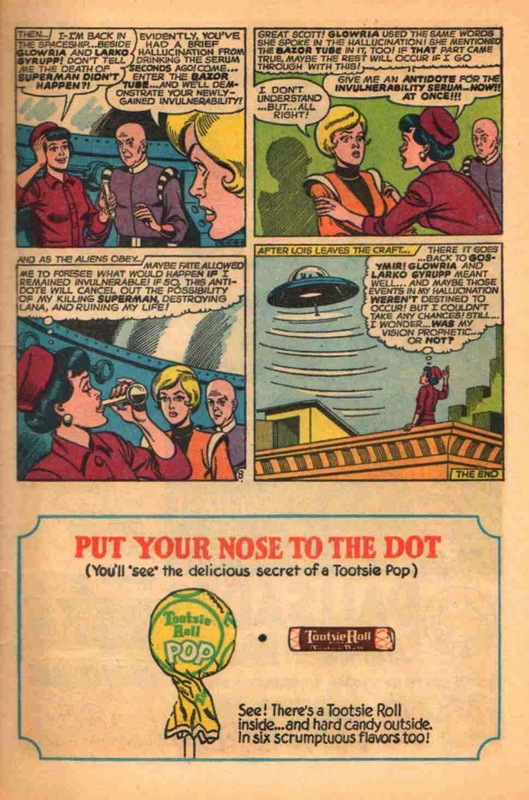 In these next two pages from Lois Lane #59, we have an ad and the penultimate page of our palpitatin' potboiler (imagine that phrase being spoken by Sylvester the Cat). "DRONES AHOY!" 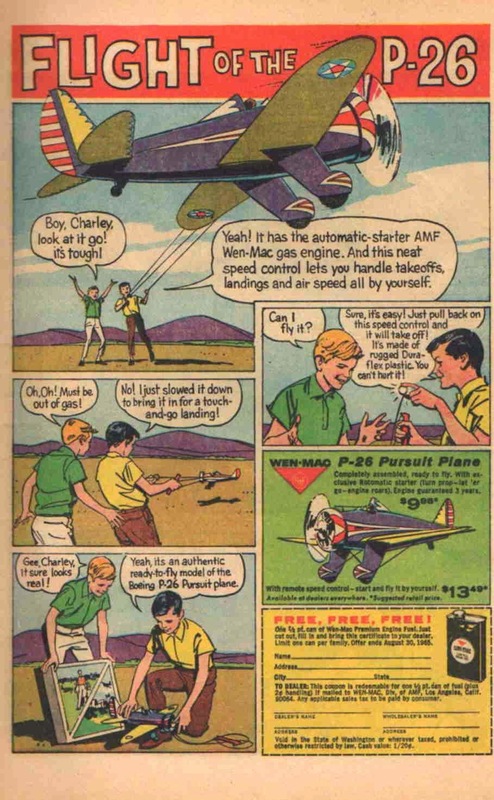 That's what YOUR friends will say when you buzz-bomb their treehouse with your new AMF P26 Pursuit Plane! With its automatic-starter AMF Wen-Mac gas engine, you'll be snagging the pigtails of your pesky little sister in no time! And won't Dad chuckle when you fly this little champion onto the backyard cocktail table and knock the beer into his lap! What great clean fun you'll have! MEANWHILE, BACK AT OUR STORY ... Lois has succeeded in killing Superman and getting Lana Lang electrocuted for the crime. Now she goes back to her everyday life by lunching with kid sister Lucy. So in a fit of atonement-seeking, Lois confesses and proves part of her story. Then, not only can she NOT be killed, society (a grand jury) decides not to execute her for her double murders, anyway! She'll have to live her invulnerable life knowing she is a vicious, murderous hag. Don;t you love the little girl in the bottom-right corner of the lower left panel? Nyah-nyah-nyah, mean lady! In the final panel we start to get the ol' swirling-stars, dizzy routine. Hmmm, something must be up. We know it's serious, because Lois's eyes are crossed.